Editor's note: This pattern was the winning entry in our Knittyspin/Spunky Eclectic/Spin Control contest! Congratulations, Kristy! The Spunky Eclectic booth was my favorite at the Maine Fiber Frolic. I fell in love with the Burning Embers colorway, especially when I opened up the braid and saw the large patches of color and the way it was brighter at one end and darker at the other. I decided to split it once lengthwise and begin spinning at the same end on each bobbin to preserve the long color changes. The result was a soft, lovely two ply yarn with colors that blended gently without being too stripey. I wanted to knit a cowl, but I knew it would have to be different from the other patterns I’ve seen. I’ve always liked the idea of a knitted cowl, but wearing one is another story. The ones that fit snugly at the neck are difficult to put on without messing up my hair, but the ones that are easy to put on allow a draft down the back of my neck or tend to bunch up under my coat. Buttoned neckwarmers aren’t much better; I never seem to get the button placement right or a width/length ratio that fits correctly and stays in place. This easy piece combines elements of both, and can be worn either buttoned or unbuttoned. Spunky Eclectic [corriedale top,]; color: Burning Embers; 4 ounces. Use a wool yarn with a recommended gauge of approx. 18 sts = 4 inches. 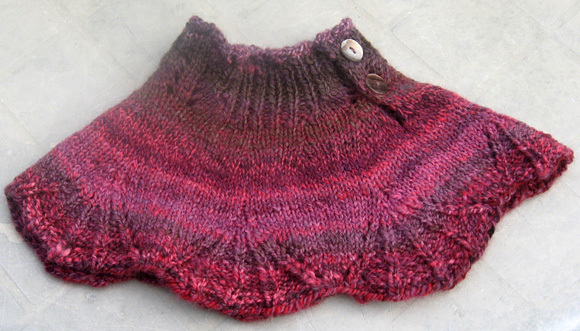 A yarn with long color changes would be most like the sample piece, such as Noro Kureyon. Note: Sample was knit using the Magic Loop technique once circumference of piece became too small for circular needle. Double-point needles or two circular needles could be used instead, if preferred. Note: When working this edging, sts are slipped with yarn held to front of work. RS Rows: K1, sl 1, k1; work in pattern to last 3 sts, k1, sl 1, k1. 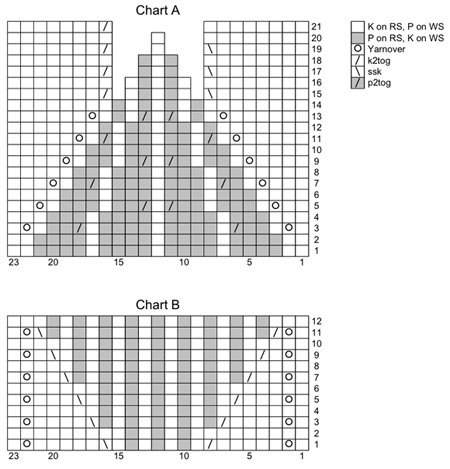 WS Rows: Sl 1, k1, sl 1, work in pattern to last 3 stitches, sl 1, k1, sl 1. This project may be worked using 2 circular needles. If you are unfamiliar with this technique, instructions may be found here. A tutorial for the Magic Loop technique may be found here. Using circular needle, CO 161 sts. Place marker and join to begin working in the round, being careful not to twist. Work Rounds 1-21 of Chart A. Chart pattern will be worked 7 times in each round. When all rounds have been completed, 112 sts remain. Work in stockinette st until piece measures 4 inches. Measure length at points between scallops, where work is the shortest. From this point, piece will be worked back and forth in rows. Work Annie Modesitt’s Slip Stitch Edge over first and last 3 sts. Row 1 [RS]: Work edging, k4, k2tog, [k7, k2tog] 11 times, k1, work edging. 100 sts. Rows 2 & 4 [WS]: Work edging, p to last 3 sts, work edging. Row 3 [RS]: Work edging, k3, k2tog, [k6, k2tog] 11 times, k1, work edging. 88 sts. Row 5 [RS]: Work edging, k2, k2tog, [k5, k2tog] 11 times, k1, work edging. 76 sts. Row 6 [WS]: Work edging, p2tog, p to last 3 sts, work edging. 75 sts. Work Rows 1-12 of Chart B, maintaining edging over first and last 3 sts as set. Chart pattern will be worked 3 times in each row. Weave in ends and block lightly. Sew buttons along one edge as shown. 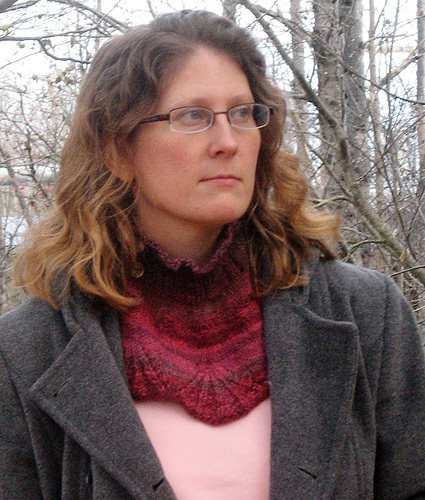 To button cowl, use yarnovers from lace pattern as buttonholes. 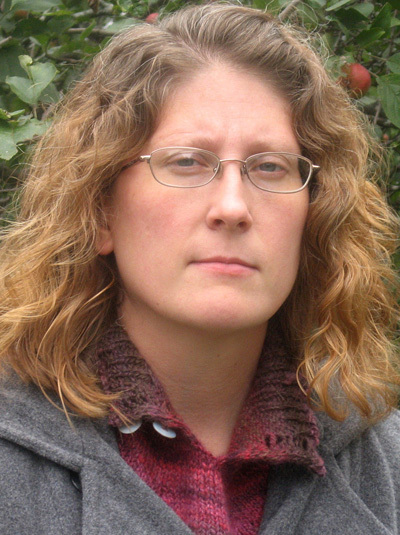 Kristy knits, reads, and spins (not necessarily in that order) in northern Maine. She can be found on Ravelry as kristyh.